Kitchy Faux Bear Skin Rugs Are Perfect for Animal Lovers! 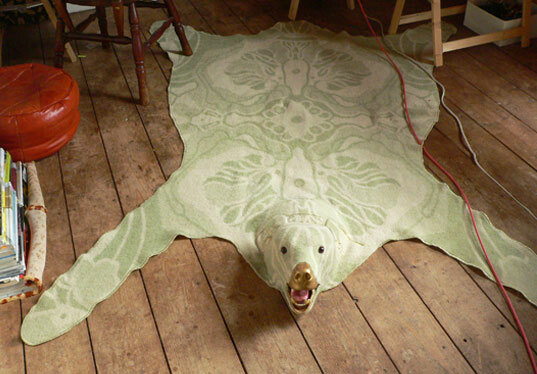 Kitschy Faux Bear Skin Rugs Are Perfect for Animal Lovers! Love kitchy log cabin decor but can’t stand the thought of cute animals suffering to feed your materialistic desires? Well check out Lise Lefebvre‘s awesome faux bear skin carpets that satisfy your floor covering fix without any of the guilt. The deceiving rugs are also made of old wool blankets, meaning they’re green to boot! In order to achieve the hunting lodge look, Lefebvre takes wool blankets she finds in thrift shops and cuts them to mimic bearskin rugs. We love the idea of putting a twist on this traditionally very animal-unfriendly accessory – the eye immediately recognizes the iconic shape of the rug but the unexpected pattern of the blankets gives it a lot of extra interest. second nature taxidermy school in bonner,Montana can hook you up with skulls, teeth, claws and anything else you may need real or artificial as well as lessons to achieve the best result! This is very bizarre. How can this simulation of a dead skind animal be perfect for animal lovers? Love kitchy log cabin decor but can't stand the thought of cute animals suffering to feed your materialistic desires? Well check out Lise Lefebvre's awesome faux bear skin carpets that satisfy your floor covering fix without any of the guilt. The deceiving rugs are also made of old wool blankets, meaning they're green to boot!